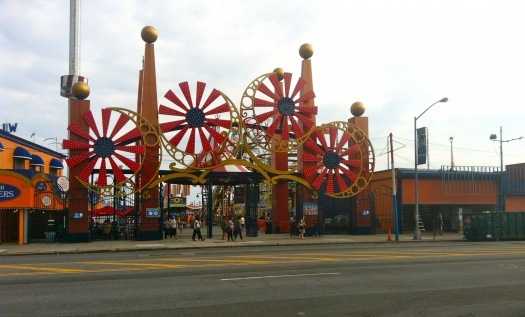 The past three years have sparked major changes for Coney Island. In 2010 they re-introduced Luna Park and opened 10 new rides that the whole family can enjoy. Thrillseekers were excited in 2011 when the Scream Zone introduced roller coasters, the Slingshot and more. And now in 2012 Coney Island’s summer season will be in full action with weekly movie screenings on the beach, a new boardwalk show called Burlesque by the Beach, and the classic rides we know and love. This Coney Island revival is transporting people back to the glory days. Back to before World War II, where a Coney Island summer was part of the American experience. It was a hidden gem among the busy urban lifestyle of New York City. People relaxed, swam along the long beach and rode on the Cyclone, America’s first roller coaster. Freak shows were the pivotal of entertainment which made Coney Island the greatest place on earth. Unfortunately after World War II, Coney Island became abandoned due to the rise of corporate America and people moving away to the suburbs. Now, it is preserved as one of America’s oldest amusement parks in history. Once you step onto the boardwalk, it’s like traveling back in time to the early 1900s. The renovations that have been happening are bringing enjoyment to a new generation. Rides such as the the Eclipse or the Tickler are nothing like the mega roller coasters in Six Flags but are still enjoyed by people of all ages. Some rides such as the Steeplechase coaster are named after park’s original classic attractions, and the Cyclone and Wonder Wheel are still standing since their debuts in the early 1900s. Coney Island has been lost for too long, and with the city’s hard efforts it is once again becoming a go-to destination. Whatever the new changes bring, Coney Island will always be a piece of New York City history in a true New Yorker’s heart.